Maybe it'll give some people a few ideas, and it'll give you a chance to see what kind of response you may / may not get. I'm tossing around the idea of going as Bob Ross! Word on the street that a popular costume this season will be the "Chilean Miner". Ooh, Chilean Miner, I like that, it would allow me to go shirtless. I am thinking something that I can slap together quickly like Don Draper or the "The Situation". That's hysterical. My next door neighbor said he is goign to be Bob Ross! I'll be answering the door in a black flowy gown with golden stars and moons on it, a witch's hat, and a beard. They're things I have around the house. I guess I'll look like a wizard. Christmas Past - a long flowing off-white gown, dripping with white battery-operated Christmas lights and plastic ornaments that looked like hand-blown antique ornaments, and a wreath on my head like a crown. Was kind of pretty. Birthday Party Table - A screen on my shoulders, with my head sticking out a hole in the screen, a long table cloth over it, a couple of place settings, balloons, and and a bowl of chips. I sat on a short stool so people didn't see my feet. In a darkened room, it freaked people out. I will be cleverly disguised as a responsible adult. That's a big transformation! I bet that costume will take you days to put together! I witch. I'm going to a kids party. WooHoo. 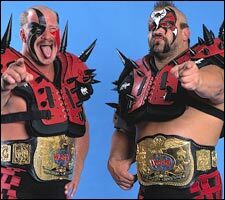 Love the Road Warrior idea. I heard a commercial for Halloween Havoc with the Rock N Roll Express, Nikita Koloff, and other wrestlers at some local high school. I had images of Mickey Rourke in my head. I'm Robin this year. My 3 year old is Batman and begged me to be his sidekick. I figure it wont be too long before the kiddos are embarrassed to see me in costume so I took advantage of this We had a Halloween event this weekend and I have to say it looked a lot better than I was expecting!